Maxim公司的MAX22191是IEC 61131-2兼容的工业数字输入(DI),能把24V数字工业输入转换成2.4mA电流,用来驱动光隔离器.电压阈值和电流值和Type 1和Type 3输入,采用额外外接电阻还和48V输入兼容,工作温度-40℃ - +125℃,主要用在过程自动化,工业自动化,马达控制,单个隔离输入以及电流源输入.本文介绍了MAX22191主要优势和特性,框图和应用框图,以及评估板MAX22191PMB# EVK主要特性,电路图,材料清单和PCB设计图. 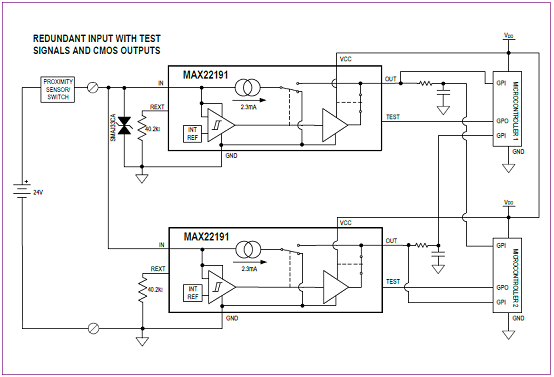 The MAX22191 is an IEC 61131-2 compliant, industrial digital input (DI) device that translates a 24V digital industrial input to a 2.4mA (typ) current for driving optical isolators. Voltage thresholds and current levels in the MAX22191 are compliant with Type 1 and Type 3 inputs, while minimizing power dissipation. The MAX22191 is also compliant with 48V inputs, with the addition of external resistors. Operating power is derived from the input signal, eliminating the need for an external field-side power supply. A 250ns (max) fast response time is ideal for high-speed inputs. Additionally, a CMOS-compatible test input is available for safety diagnostics. The MAX22191 features robust functionality for harsh industrial systems and is capable of normal operation with input signals ranging from -60V to +60V. Integrated thermal shutdown further protects the device when VCC is present. The MAX22191 is available in a small, 6-lead SOT23 package and operates over the -40℃ to +125℃ ambient temperature range. 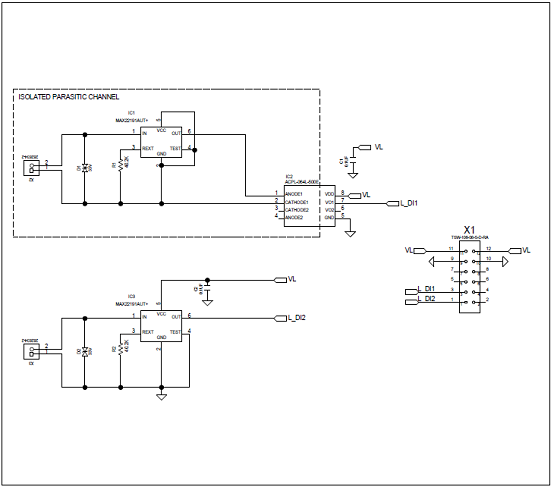 The MAX22191PMB# peripheral module provides the hardware to evaluate the MAX22191 parasitically powered digital input. Refer to the MAX22191 IC data sheet for detailed information regarding operation of the IC. The PMB features two circuits: one for isolated parasitically powered circuit (using an optoisolator) and one for a 24V input signal with the circuit powered from a low-voltage logic supply. The module can be used in various ways. Maxim sells low-cost USB2PMB1#, USB2PMB2#, and USB2GPIO# adapter boards that use the Munich GUI software for communication through a USB cable. This is not included with this board. Alternatively, any microcontroller or FPGA with a 12-pin Pmod™-compatible connector can be used. Another option for the user is to wire-wrap a temporary connection from their system to the pins on connector X1. For these later two options the user needs to write their own control software. 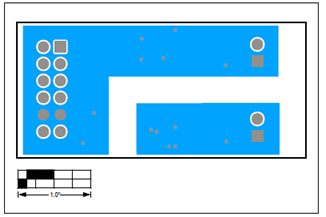 The Pmod PCB dimension is just 42mm long x 20mm wide, with the width determined by the size of the X1 connector.